Manta, Manta. On Thursday 13 March and Sunday 16 March, Dive Asia encountered several Manta Rays during our Raja Noi daytrips. During the Thursday cruise, all of our divers had the pleasure to dive twice with the majestic ray almost shoulder to shoulder. During the second dive of the day, there were two Mantas present and on the third dive we dove with a huge Manta Birostris. On board were many certified divers as well as seven Open Water students and two Discover divers. All of them enjoyed swimming with the beautiful Mantas. During the Sunday dive, we once again had two Manta Rays at the “South Tip” of Raja Noi and our divers also had the opportunity to observe the Gracie Rays. Mantas have a wing span up to seven meters and can weigh as much as 2000 kilograms. 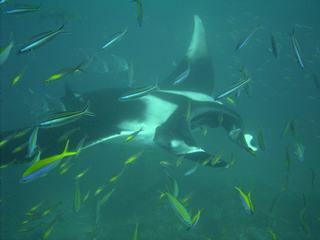 Compared with many other rays, Mantas are not poisonous. They are peaceful animals who eat plankton. They spend most of the time close to the lighted waters near the ocean surface and therefore are easy to observe by divers. Similar to the Eagle Rays, Mantas use their fins much like a bird’s wing. They reach a top speed of twelve kilometers per hour. Mantas are known as underwater acrobats and are able to jump a few meters out of the water. 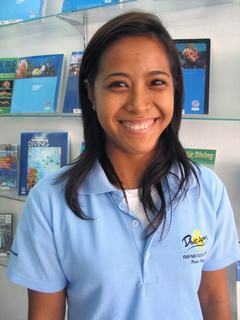 Somsri “Nid” Choojan will assist you in selecting your dive excursions, courses, and equipment. She can help you decide on the right choice for your diving adventure. Born in Surat Thani Province, Nid previously worked as a sales person for one of Thailand’s biggest dive equipment retailers as well as in a dive shop on Ko Tao in the Gulf of Thailand. 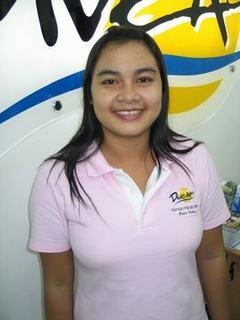 These jobs helped Nid to gain great knowledge about Thailand’s dive industry and she has integrated quickly into our team. She is a certified PADI Advanced Open Water Diver with more than 50 dives under her weight belt. All of this makes Nid the perfect advisor in all diving related areas. She works at both our Kata and Karon shops. Also new on the Dive Asia team is Warawan “Som” Pangpairee. Originally from Bangkok, Som joined us at the beginning of 2008, taking care of the accounting. Som concentrated on Maths in high school and studied the course in Marine and Coastal Resource Management Technology while at university. Both areas have proven her to be very beneficial to us. She worked her first job following graduation from university on the administration staff of the Thai Austria Technical College. He duties included dealing with different government agencies, another area which makes her a valuable member of your Dive Asia team. Som works at our Karon shop. Starting today at irregular intervals we will publish news about our live-aboard cruises, day trips, and diving courses as well as information from and about Phuket and anything else we believe you would be interested in knowing. You will also find our special offers, photos, and much more. We hope to keep you updated and entertain you with interesting stories and news items. Enjoy reading our blog and feel free to explore our Archives.